Hello! It’s November! I know you didn’t hear from me pretty much all of October but I’m back – fresh from a birthday trip to HAWAII. YESSSSS. 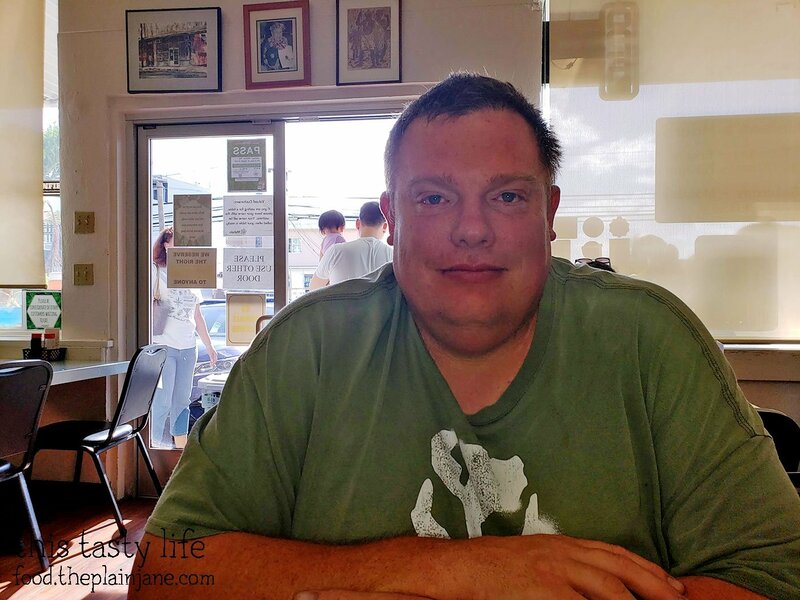 I reached a milestone birthday this year (40 – gasp!) and I figured the best way to take off the sting was to go on a big trip and Hawaii fit the bill. 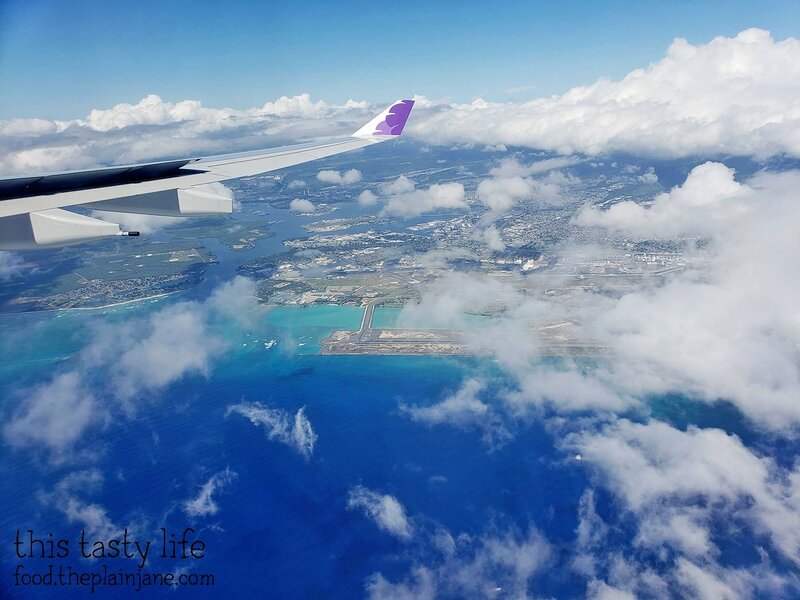 Jake and I rode Hawaiian Airlines for our non-stop flight to Honolulu. Here’s a view above the island before we landed. I was quite pleased with our choice of Hawaiian Airlines. Jake and I got to sit in a row with just two seats and they really set the tone for your trip to Hawaii. Hawaiian music plays while everyone boards the airplane. 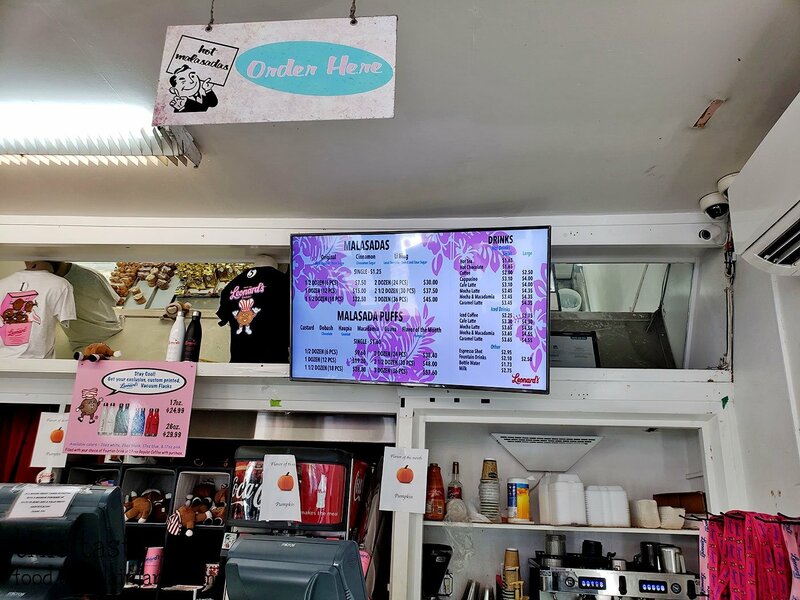 There are free videos to watch about Hawaii on the screen in front of you. You get an included lunch meal (ours was hot roast beef and cheddar sandwiches) and right before you land, they serve a Koloa rum punch cocktail to passengers 21 and older. A nice way to start a vacation! 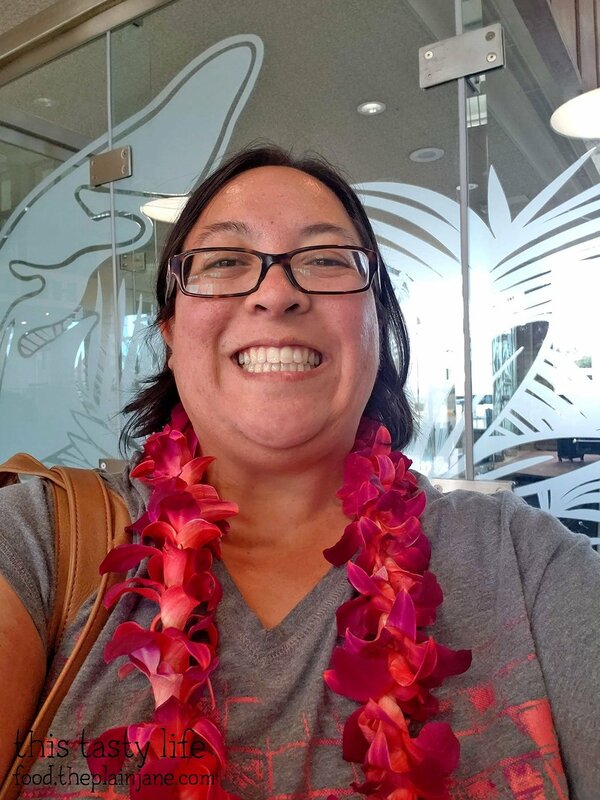 I did not get the “lei greeting” when I got right off the plane since it’s a silly amount of money. But, we did pass by a lei stand and Jake bought me a lei to wear out of the airport. I also got to choose which lei I wanted and it was a ton cheaper (though it’s cheaper if you venture into town to get one, but for convenience’s sake, this is a great option). I believe this lei was about $15 and it smelled wonderful! I felt like I was carrying a bit of the island scent with me as we walked to pick up our baggage and get our car rental. 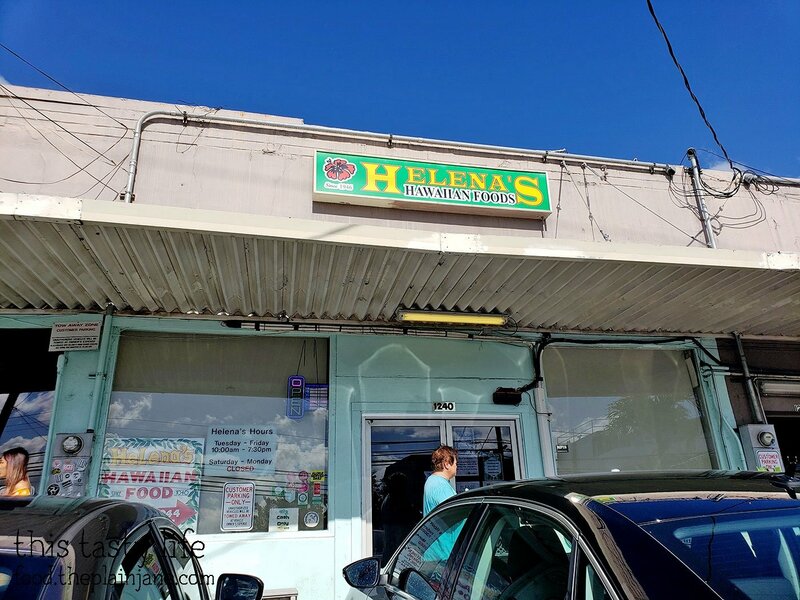 Our first stop was for food at Helena’s Hawaiian Foods. It’s in a little strip mall away from the main part of town. There were plenty of tables for us at Helena’s Hawaiian Foods at about 3PM on a Wednesday afternoon. We actually discovered that we sat next to a family that was also from California! 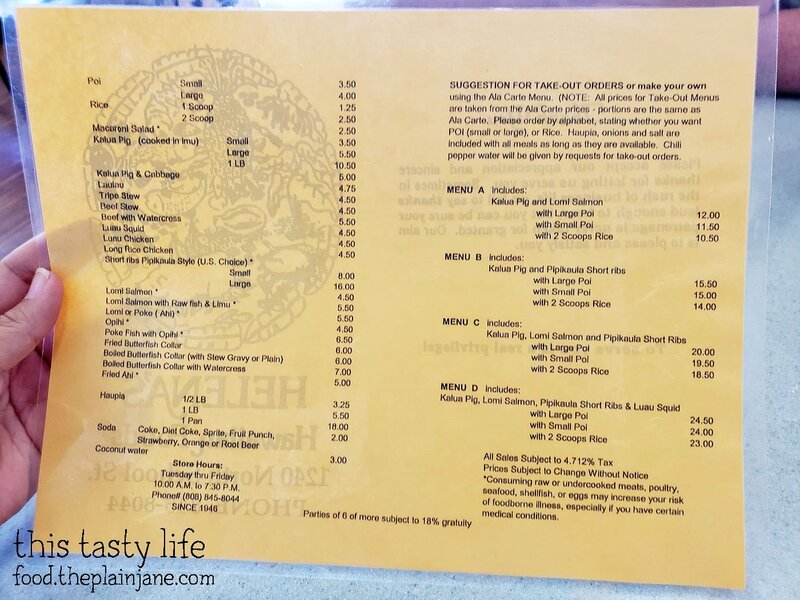 The menu at Helena’s Hawaiian Foods. You can order items a la carte, or get one of their “take out menu” combos. We decided on a combo and our waitress came up to us and correctly guessed our order. I take it that’s what a lot of out-of-towners get…. Menu B! We got one order with rice and one order with poi and I added a side of macaroni salad. The prices above are per person. 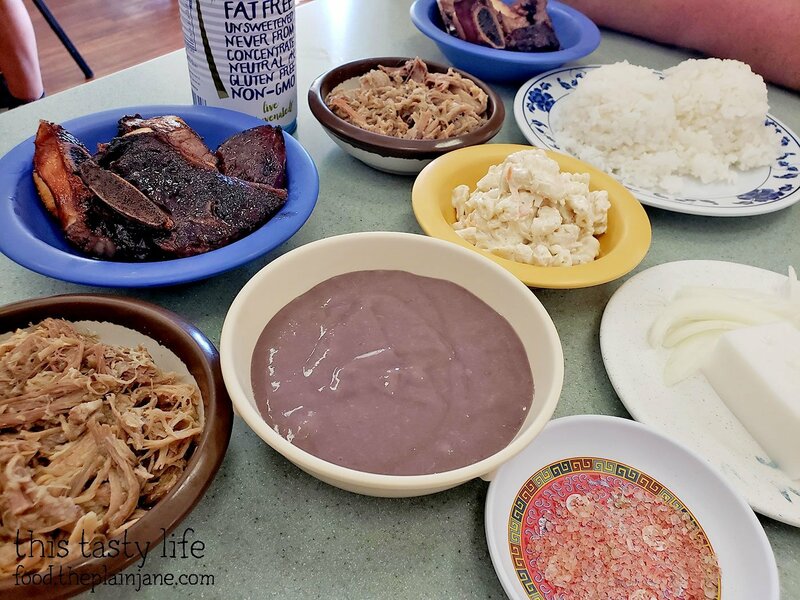 We got the Pipikaula Short Ribs, Kalua Pig, and Haupia with onions. Pipikaula is a type of “dried” beef. 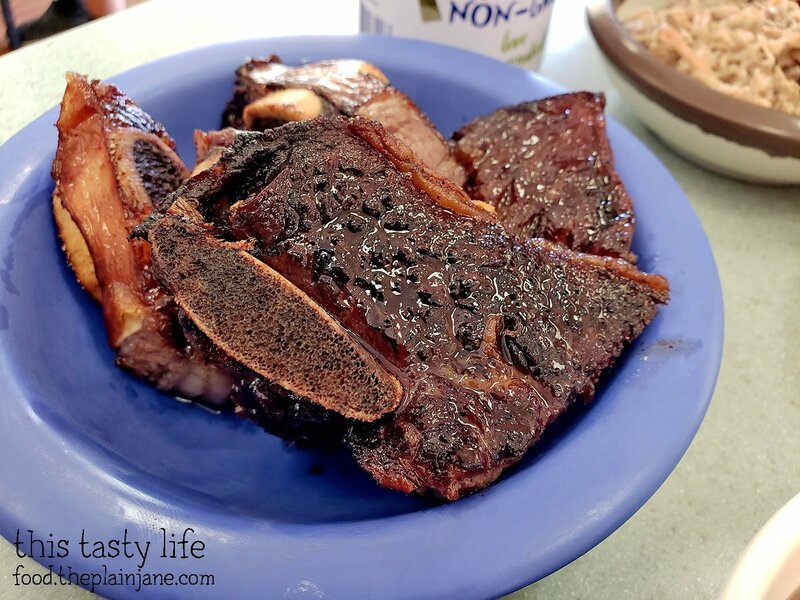 At Helena’s Hawaiian Foods they marinade the beef, then dry/cure the beef, and then finish it off by frying it. The result is an incredibly tender, slightly crispy beef that is like nothing else you’ve tasted. 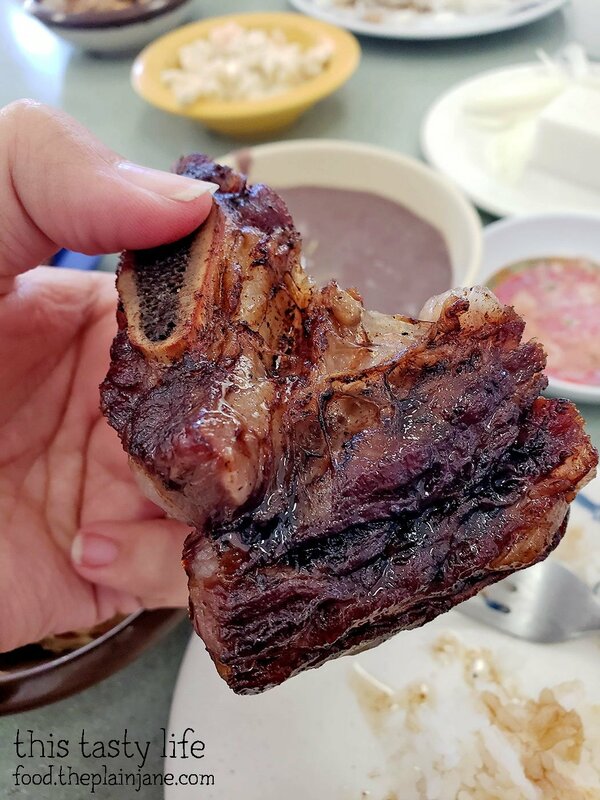 It tastes nothing like the short ribs we have on the mainland. The flavor is intense and the texture is awesome. Jake and I really really really loved these – they tasted so wonderful! Check out the juicy fatty pieces on this meat. OMG. I wish I could have another bite right now! The kalua pig is the other meat for this combo. It’s cooked an in imu, or underground oven. It has an incredible smoky flavor and oh-so-tender. That purple stuff right behind it is the poi, which is made from taro root. I saw a video that the best way to eat poi is as a dip. 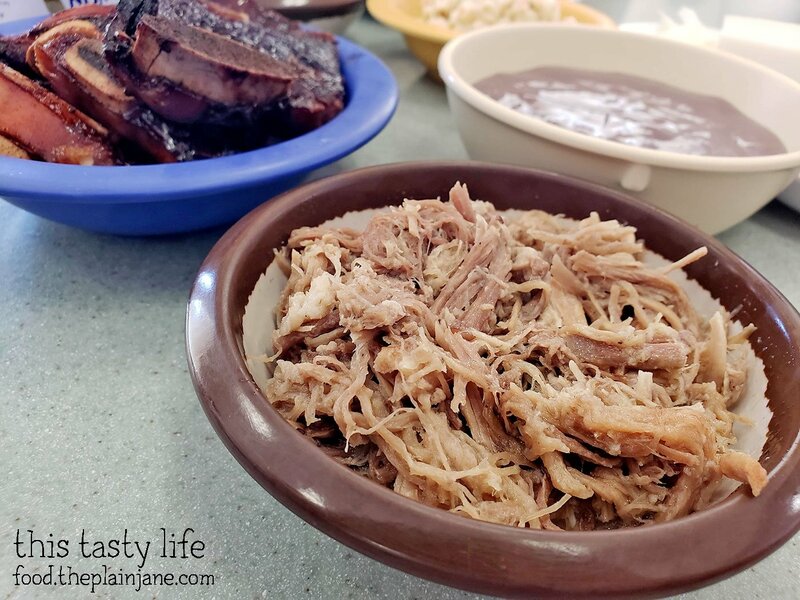 The poi has a bit of a neutral flavor on it’s own, so dipping your kalua pig into the poi helps balance the flavors of the meat and enhances the flavor. Next to your haupia there are some onions which are used to eat along with the meal. You can dip the onions into salt and/or poi and eat it along with meal. I liked it! The haupia is a coconut pudding, very mild in taste and it has a nice creamy, smooth texture. It’s a nice way to end the meal of richer foods! Jake and I really liked Helena’s Hawaiian Foods and thought it was a great way to kick off our trip. Definitely highly recommend it! 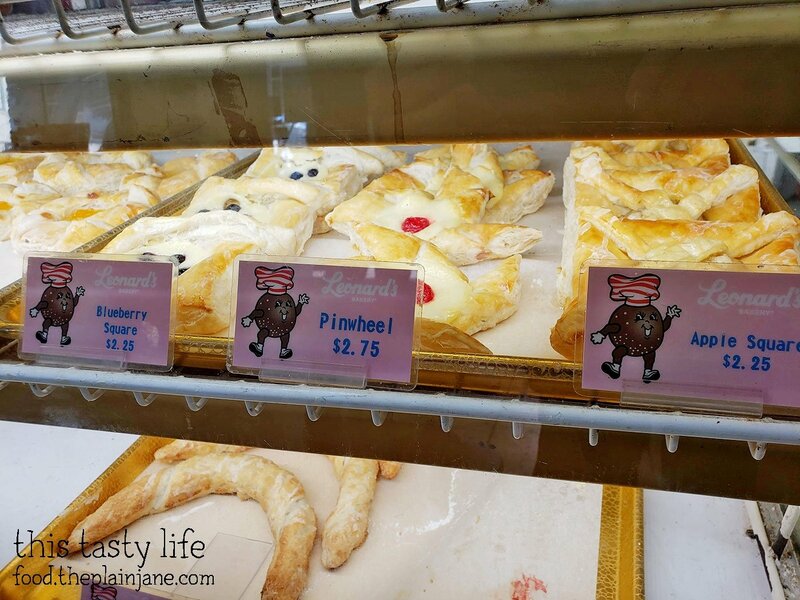 After lunch, we stopped for dessert at Leonard’s Bakery. 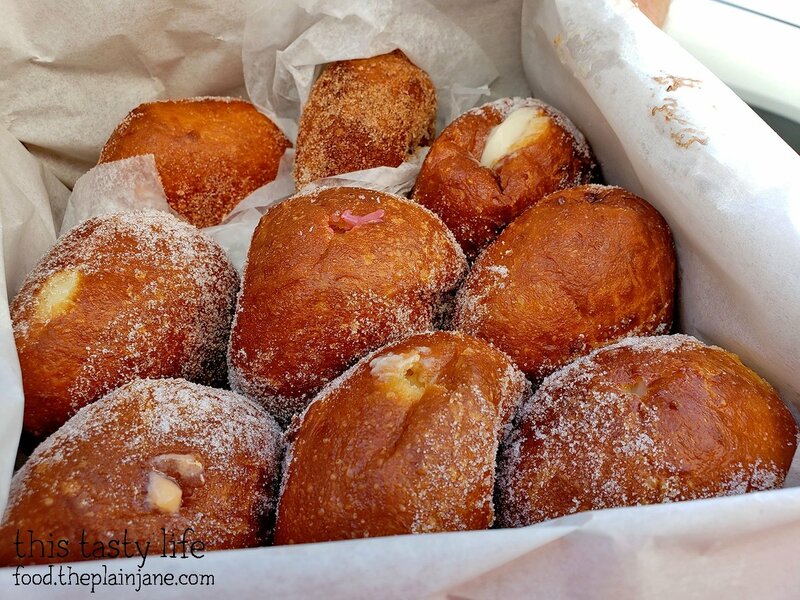 Leonard’s Bakery is known for their malasadas which are Portuguese donuts. 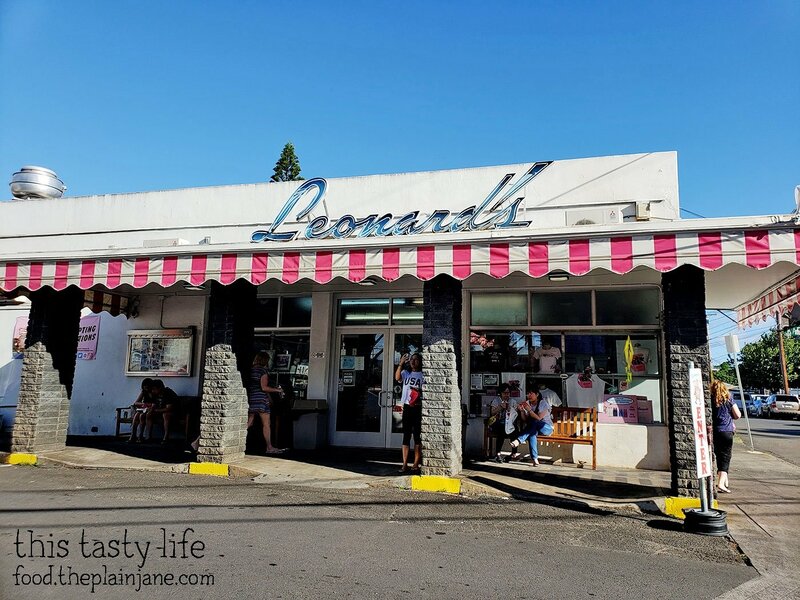 The malasadas are made to order here at Leonard’s. We placed our order (one of every donut) and waited about 15 minutes for our donuts to be made. When we placed our order no one was in the shop… but by the time our order was ready, the place was FULL. 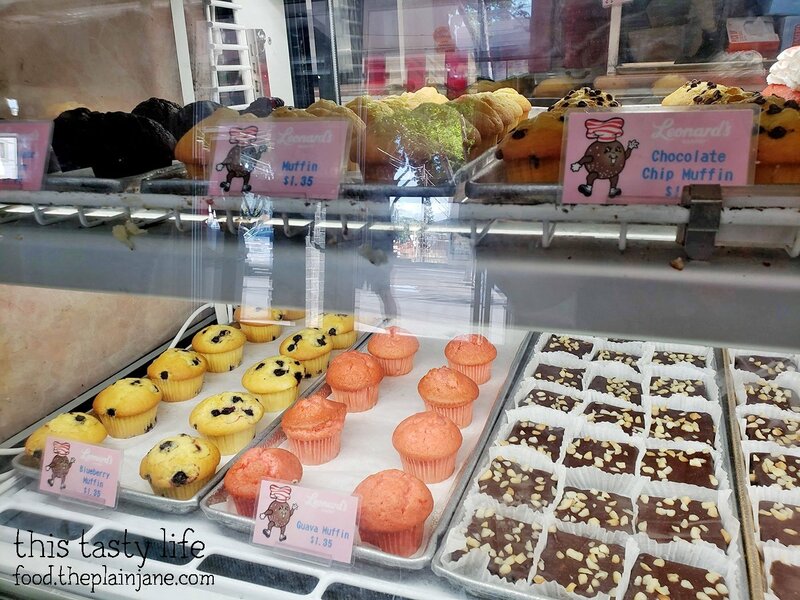 Here’s a few other items in their bakery case at Leonard’s. 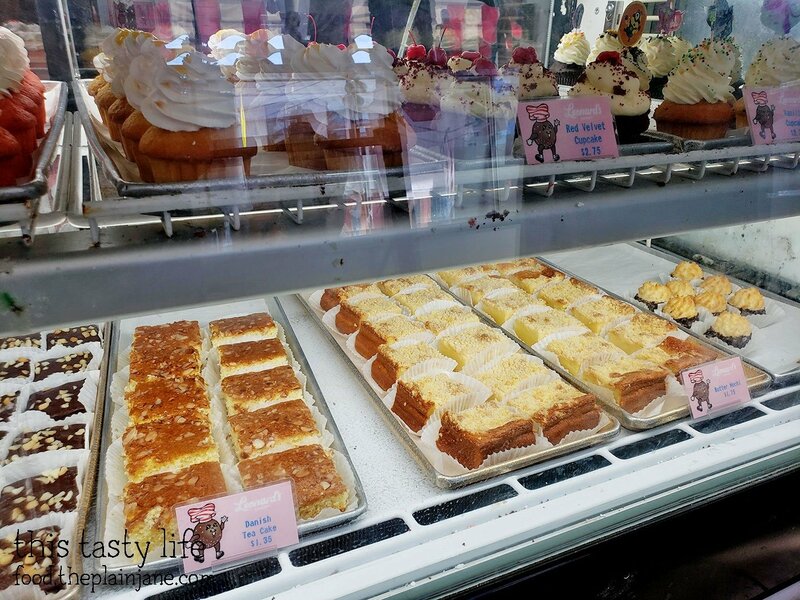 On the bottom right… butter mochi. I tried that at another place. Muffins and brownies, oh my! Once we had it in hand I thought, “damn why did we order this many” but NO FEAR. We merely sampled each one and did not actually fully eat them all. 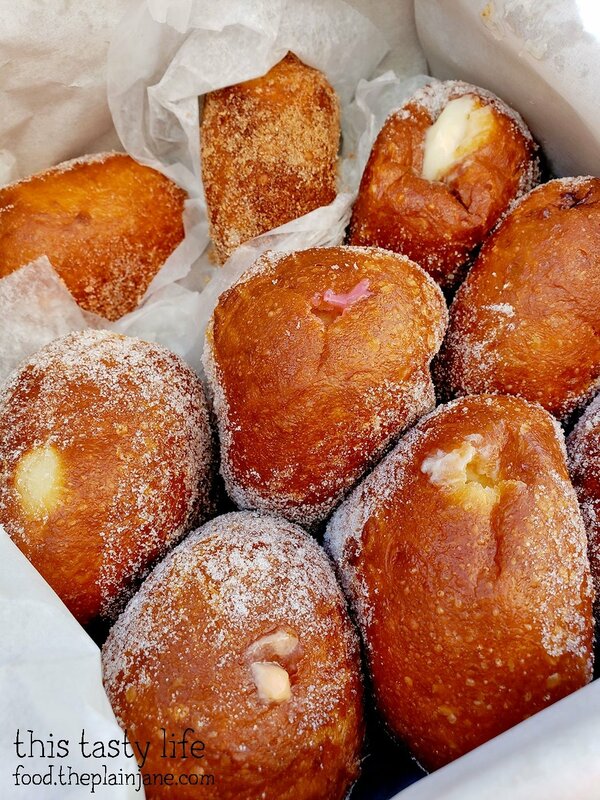 There are three unfilled donuts which are called the Malasadas and the rest are filled, or Malasadas Puffs. The three unfilled ones are Original (sugar), Cinnamon (cinnamon sugar), and Li Hing (sweet and sour sugar). 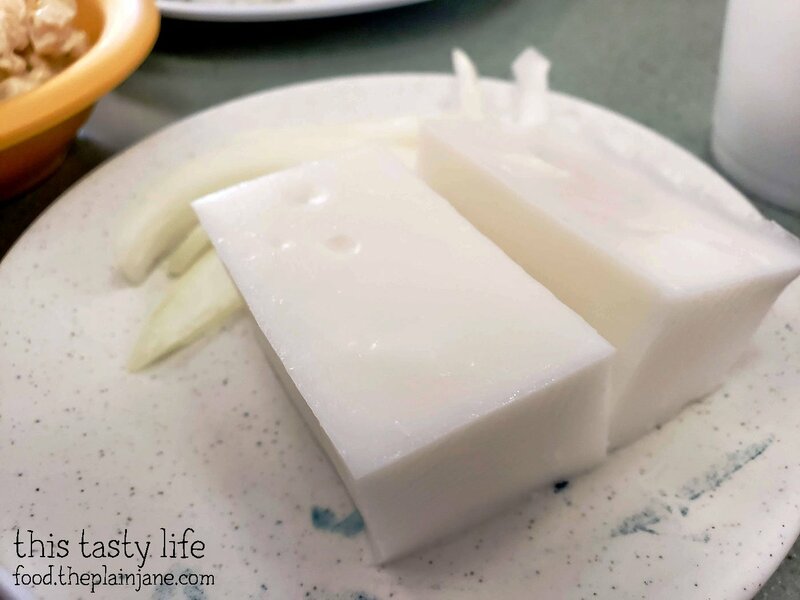 We discovered more about Li Hing powder later in our trip! 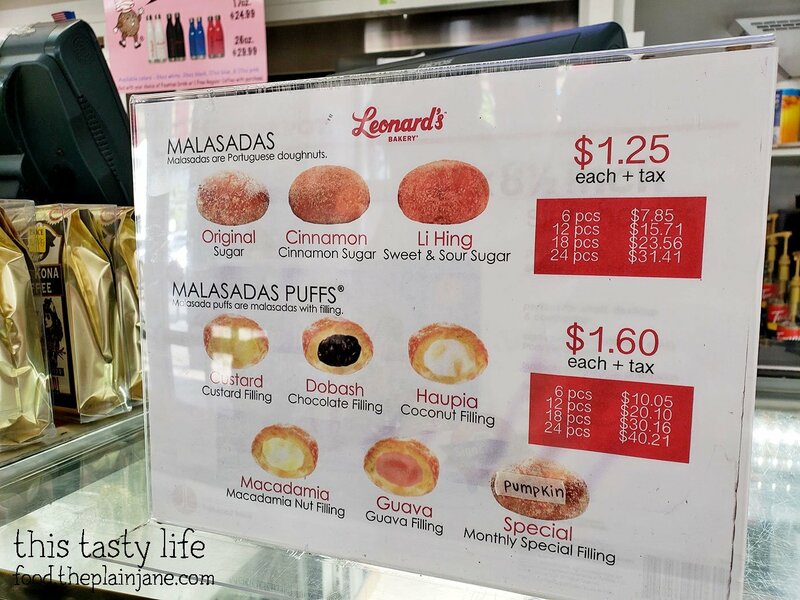 The Li Hing was Jake’s favorite of allllllll of the malasadas we tried at Leonard’s Bakery. 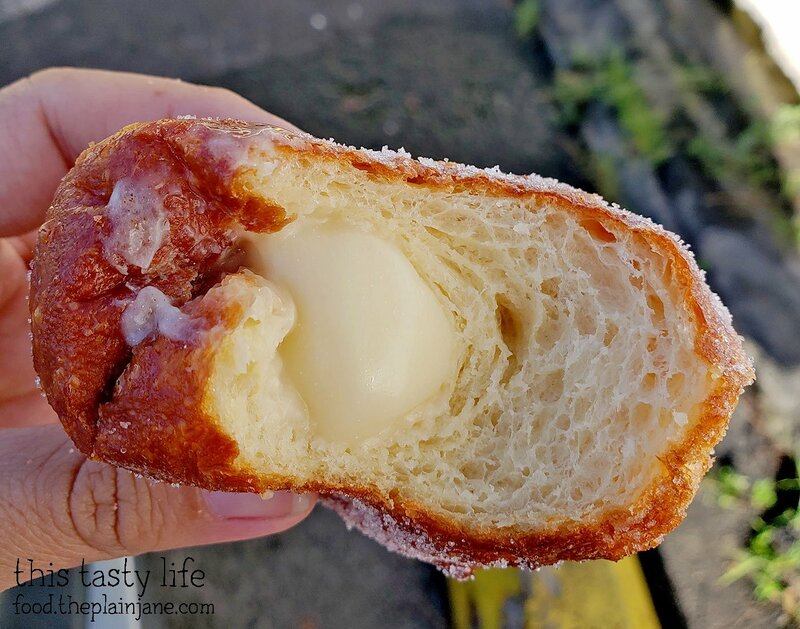 The thing I noticed the most about the malasadas were that you can really taste the yeast in them – so it gives the malasadas a slightly sour bread taste of them. 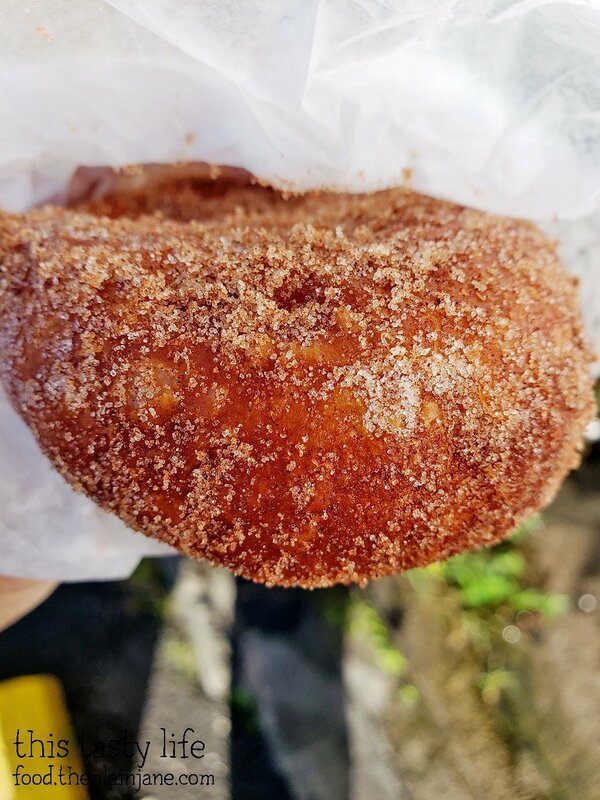 For the puffs, or filled malasadas, we sampled donuts filled with Custard, Dobash (kind of a dark chocolate filling), Haupia (coconut), Macadamia, Guava, and a special Pumpkin filled donut for the month of October. My favorite was the macadamia nut filling – it was creamy and sweet and paired well with the yeasty doughnut. We certainly got our fill of donuts that day! After eating a proper meal, we headed to our Airbnb in Hawaii Kai, a neighborhood in Honolulu. 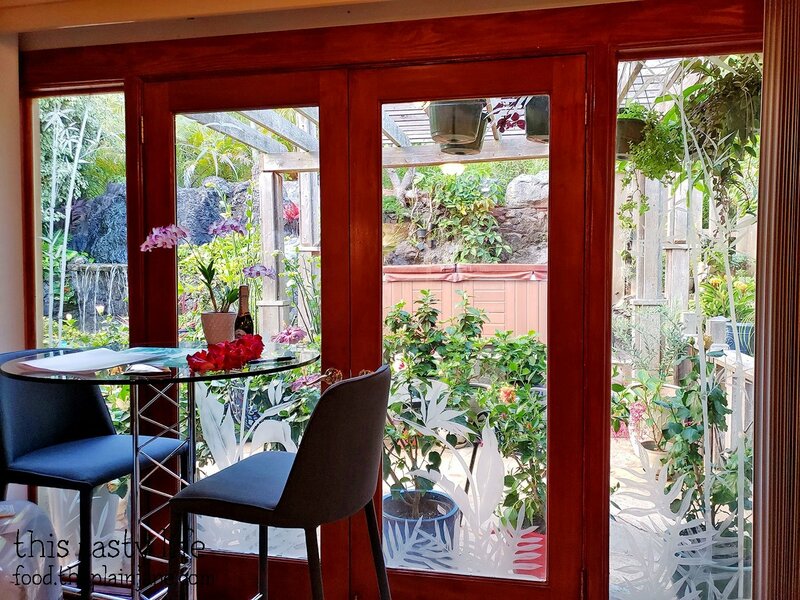 Our place was perfect – a quiet getaway away from the bustle of Waikiki/Honolulu. 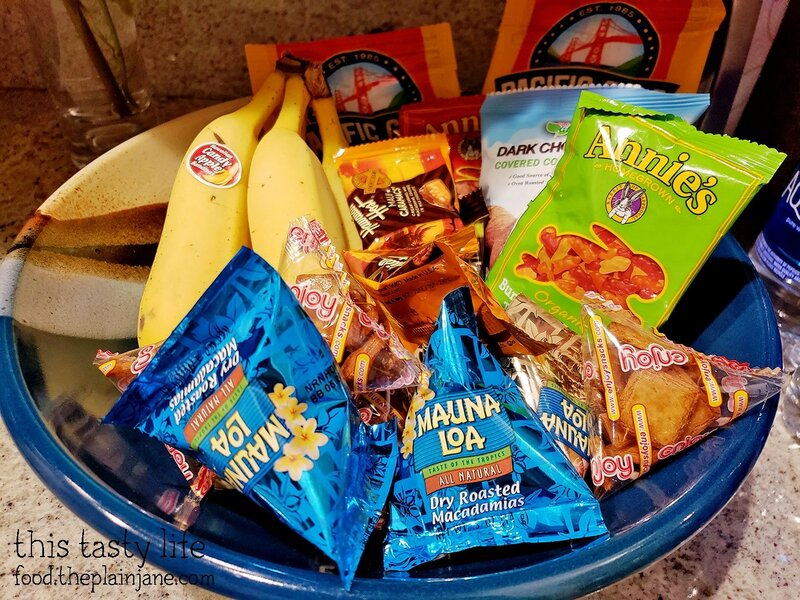 We had a wonderful garden to enjoy by our hosts, a hot tub, and a bunch of snacks! Mmm, snacks. We didn’t do much the rest of that first day and saved our energy for our first full day in Honolulu! Wishing you a belated Happy Birthday Mary. I actually grew up close to Leonard’s and if you look across the street past the park…well, that’s my High School. Hope you had some great eats. Thank you very much, Kirk! WOW! I was right in your old hood – that’s so cool! We definitely had some really great food, I’ll be doing a few more Oahu posts over the next few days/weeks. Thanks again! Thank you, Soo! They were both delicious! Thank you, CC! Haha! I do wish the puffs were smaller, too, more like donut hole sized. Then you wouldn’t have to eat so much to get to the filling! The ribs were amazzzzzzzzing! So good, man.